Disability studies has engaged with discourse analysis in key works both from the UK and the USA. While the perspectives and analyses of discourse analysis have proved well suited for exploring disability, however, its methods have not been sufficiently developed in a disability studies context. Conversely, discourse analysts have traditionally been concerned with social issues and fields in which asymmetric power relations, marginalization, and discrimination play a central role, e.g. gender, race, ethnicity, and sexual orientation, all of which share many analytical features with disability. But although efforts have been made to integrate disability into the discourse analysis and conversation analysis canon, the link between the two fields needs to be strengthened. 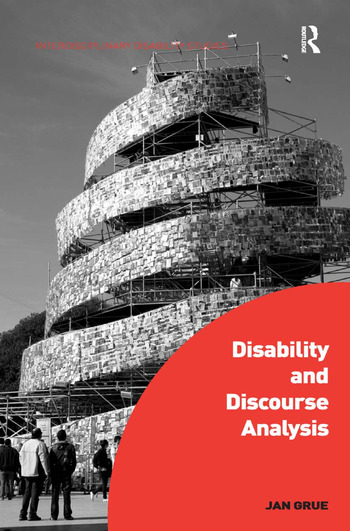 This ground-breaking volume contributes to this link by thoroughly applying the analytical vocabulary of discourse analysis to issues that are central to the field of disability studies. It strengthens disability studies by supplying case studies of representations and constructions of disability and disabled people in discourse, theorizes the role played by language in the social construction of disability, and makes disability a more salient topic for discourse analysts. Jan Grue is Postdoctoral Fellow in the Department of Sociology at the University of Oslo, Norway.